The preschool group is run in our purpose built building adjacent to Mayfield Primary School. The toddler group meets in the community room at Mayfield Primary School. All of our key staff are well qualified and experienced and all adults working with the children on a regular basis have enhanced criminal records checks and background checks. In addition, we may have extra members of staff working as one-to-one support to particular children, students on placement or work experience and regular volunteers. Please read our staff page for further information about our staff members. Under Fives Roundabout is run by an elected committee, which ensures that major decision-making is in the hands of the parents who use the groups. The committee is responsible for reviewing both policy and practice, the employment and appraisal of members of staff, fundraising, and many other tasks that ensure the smooth running of our groups. Our Annual General Meeting at which the committee for the following year is elected is held in October, however new members are welcome at any time of the year. 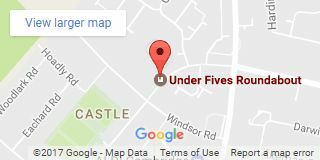 Under Fives Roundabout is a registered charity and not-for-profit community group, established in 1980 in the Round Church Hall. We moved into our own premises for preschool in September 2008. The building is located on grounds leased from the County Council at Mayfield Primary School and was built thanks to a lot of hard work by a team of parents and staff. Our policies are reviewed by staff and committee on a rolling basis throughout the year, and new policies or procedures are added as required. Please see our policies page for further details.